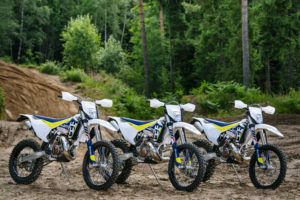 Since Stefan Pierer, the owner of KTM, bought the formerly Swedish Husqvarna brand, they have managed to position it in a manner that is befitting the 113 year-old name, and the first manufacturer to be called an off-road brand. 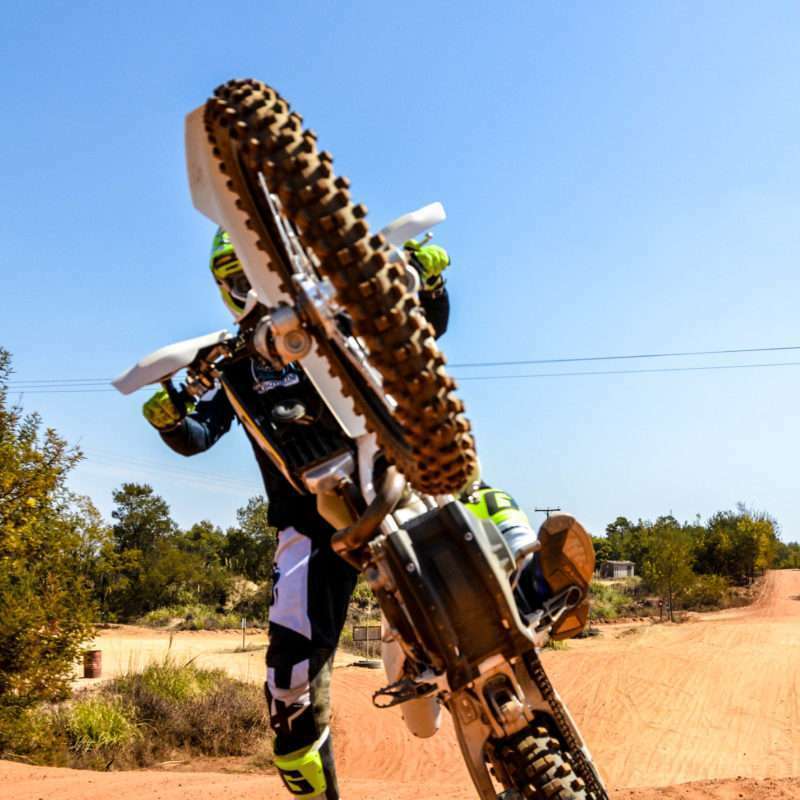 It’s true that KTM and Husqvarna share a good deal of technology – especially their engines – but Husqvarna has always had a good deal more highbrow classiness about them whereby the owner of a Husqvarna can look across at the orange crowd and have a good chuckle. 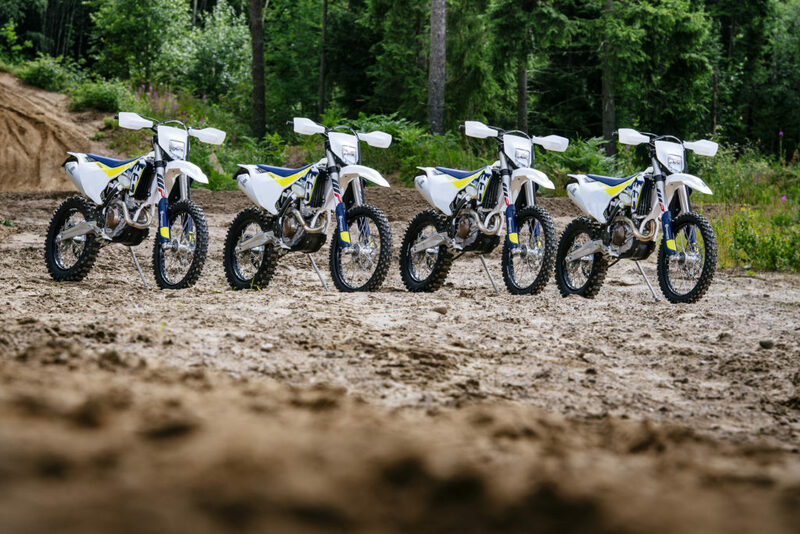 Their 2017 enduro range is no exception, boasting a litany of new features and technologies never seen as standard goods on an enduro bike before. They are 90% completely new, meaning only 10% of the parts crossover from the previous model. 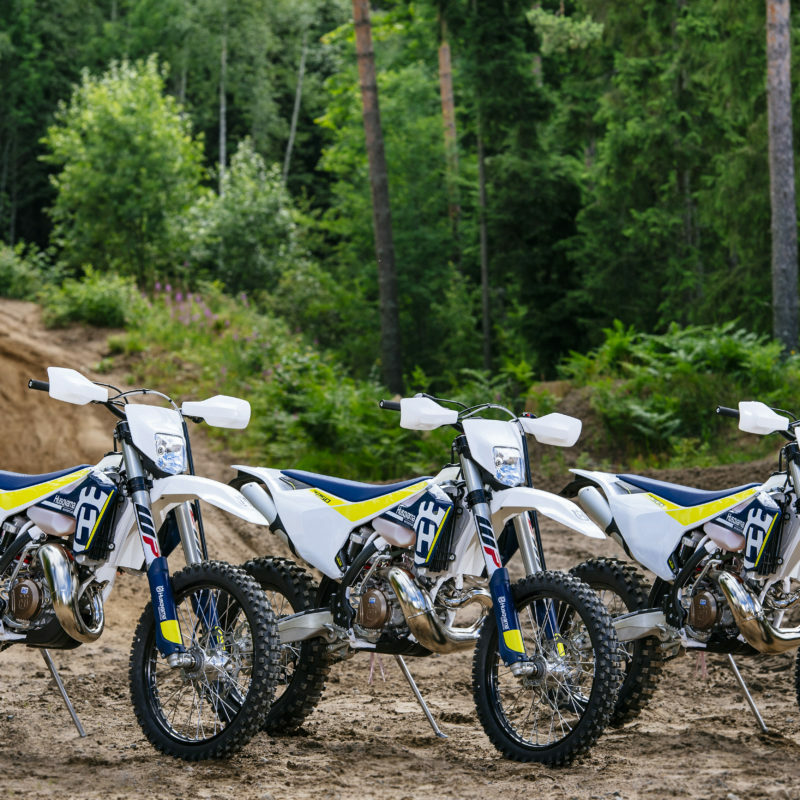 This is an achievement, as it normally takes a manufacturer four years to complete a change this radical; Husqvarna has done it in two. Overall, they are lighter, with the big 450 and 501 weighing as much as 6kg less. This is done through a lighter main frame that is 0.6km lighter, and more so has revised flex with the torsional rigidity being raised by 20% and the longitudinal rigidity going down by 30%, meaning assistance with the bumps and less twisting in the bends. The new frame with a carbon-fibre sub-frame. 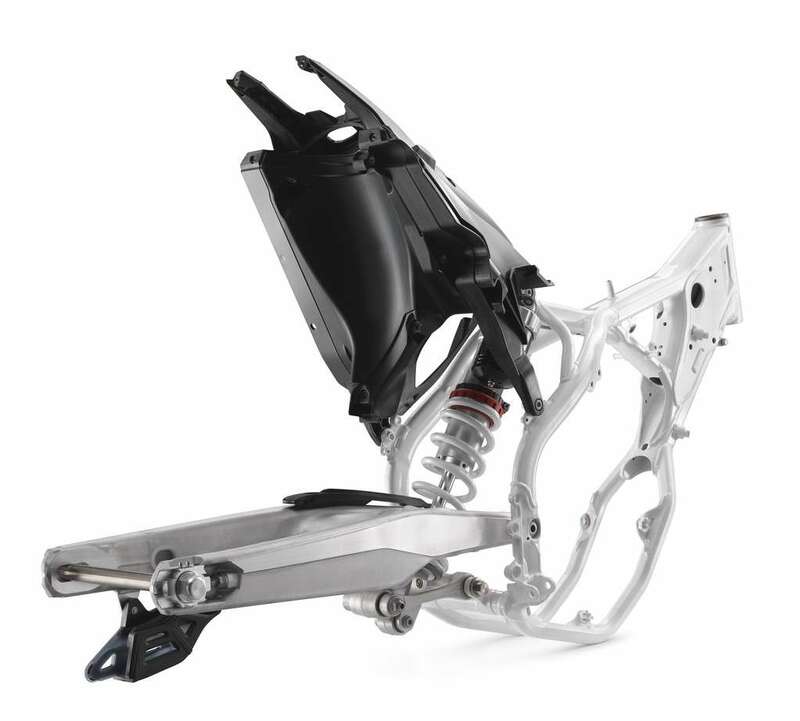 The subframe uses a first-for-enduro carbon-fibre make-up that not only weighs 1kg less, but also flexes in the case of an accident instead of bending or breaking. They’ve also made use of a new Li-ion battery to power their electric start that weighs an incredible 1kg less. 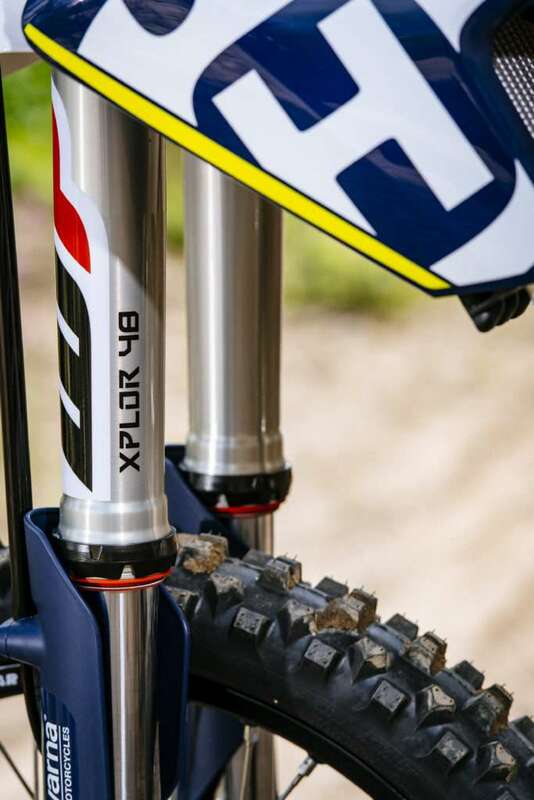 The WP rear shock is 0.36kg less, and now uses dual pressure chambers, meaning the damping is more consistent. 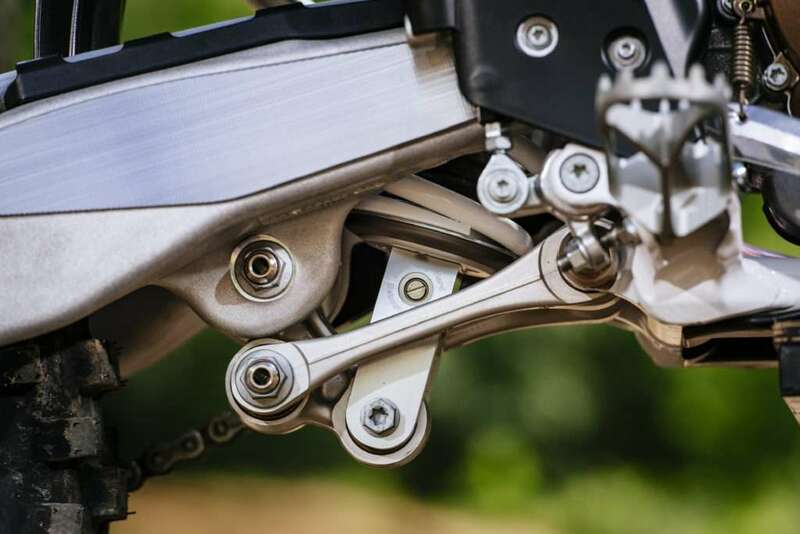 It is also attached to a new linkage that is now designed especially for enduro use instead of simply being borrowed from the motocross division. 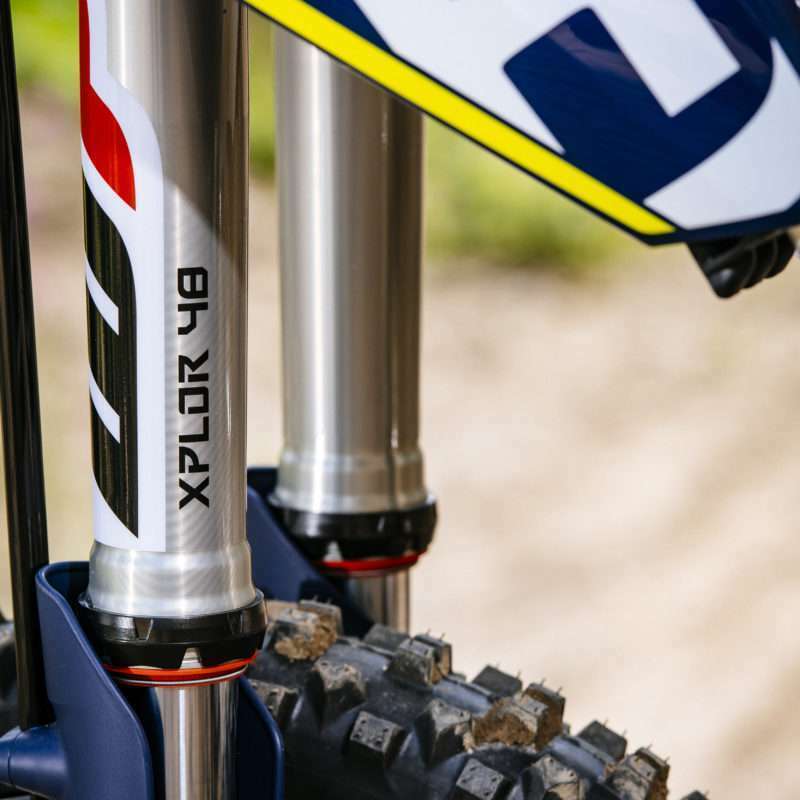 The front forks are the new WP Xplor open cartridge models, where the left fork handles compression and the right fork handles rebound. 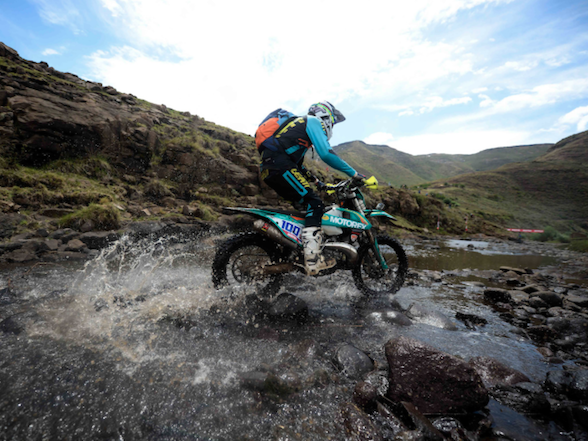 They also make use of metal springs, that sounds a tad outdated compared to the lighter air spring alternatives, but this is because air springs require constant adjustment in pressure whenever you change altitude, which becomes problematic when you are scaling the Maluti Mountains. The footpegs are self-cleaning, meaning the when you dig them into the soil while leaning around a corner or, more probably, while falling over, the soil will not get stuck in the hinge and sticking the footpeg. 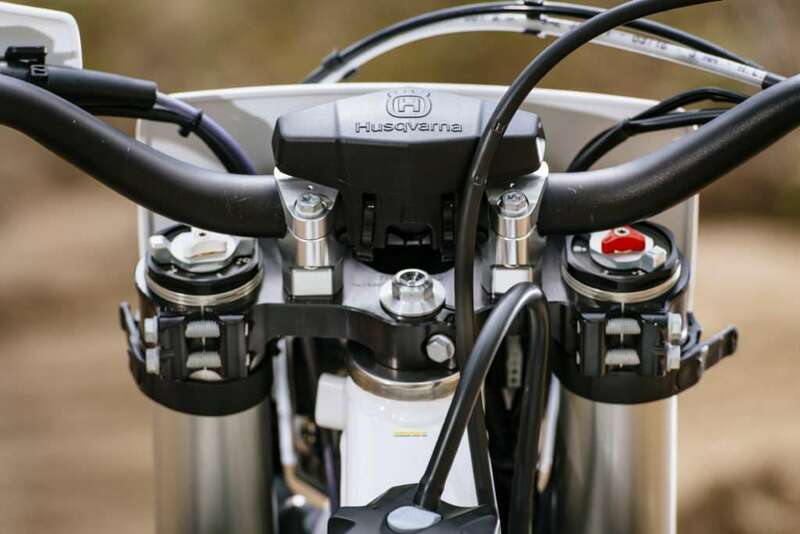 The engines boast better power and better mass centralisation, as all the shafts are moved slightly closer together, leaving the MC just above the gearbox, where Husqvarna says it should be. The motors have improved performance depending each model’s need. 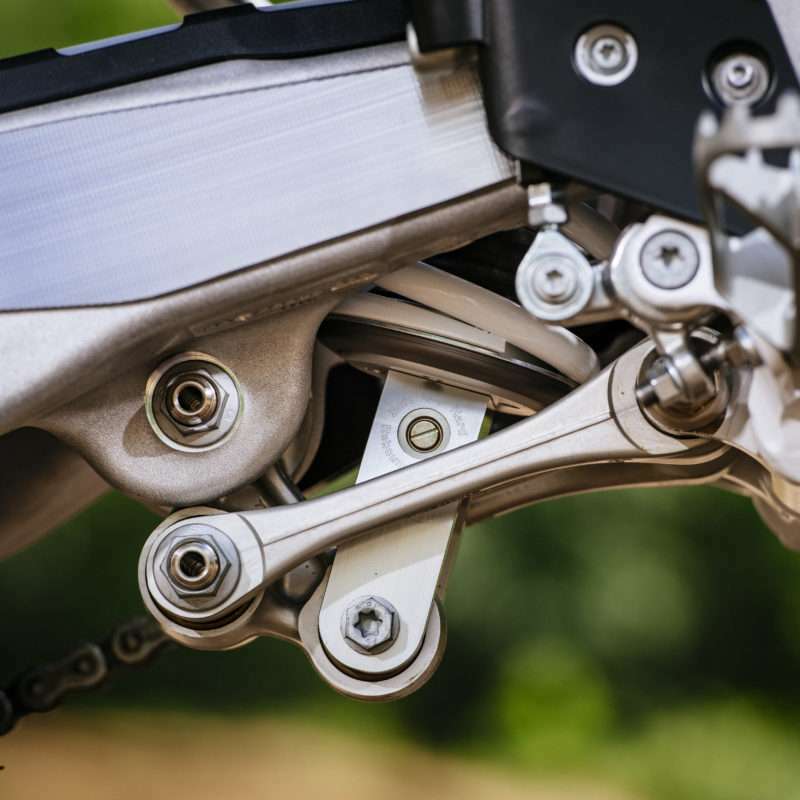 The 250 and 350 four-strokes have more power throughout the rev ranges, with the 350 getting more bottom end in particular, reinforcing its position as having the grunt of the 450 the lightweight of the 250. 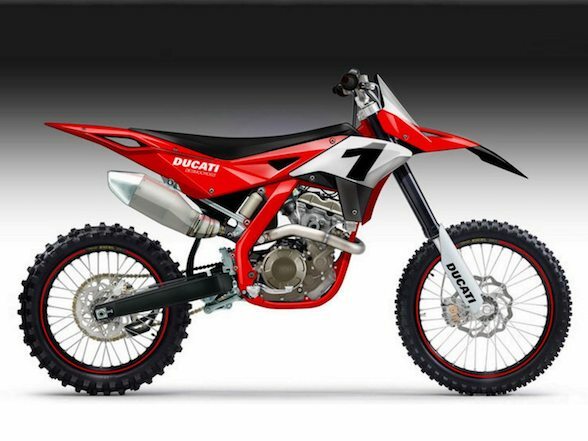 The 450 and 501 also have more power throughout, with the 501 now pushing 63hp which, on rough trail, feels like the equivalent of having 300hp on tar. Though you do not have to maintain that power all the time, as these new four-strokes now make use of two rider modes, a first as standard for an enduro bike. While the full mapping unleashes the full power, there is a second mapping that feeds it on more gently. 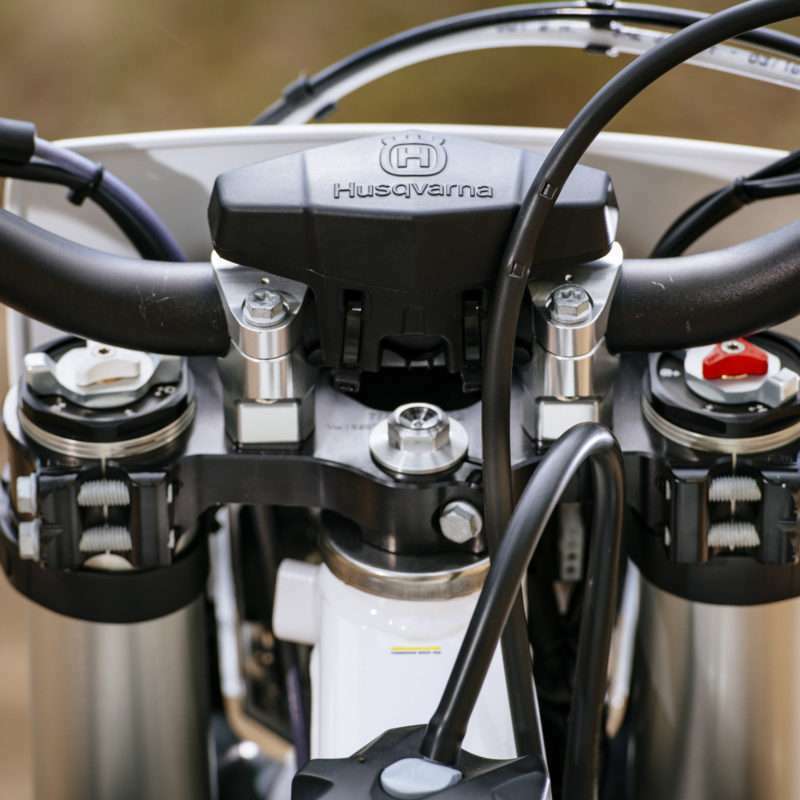 The new linkage on the 2017 Husqvarnas. To add to this, they also have switchable traction control. These first made an appearance as an option for the 2017 enduro KTMs, but come standard on the Huskies. 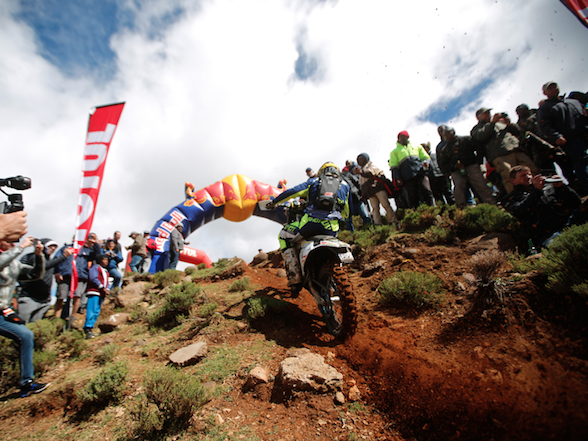 It might sound counter-intuitive – traction control on an enduro race bike? Pah! – but their design is hugely clever, so much so that at the grippy, dry Rhino Park we couldn’t actually feel it working. 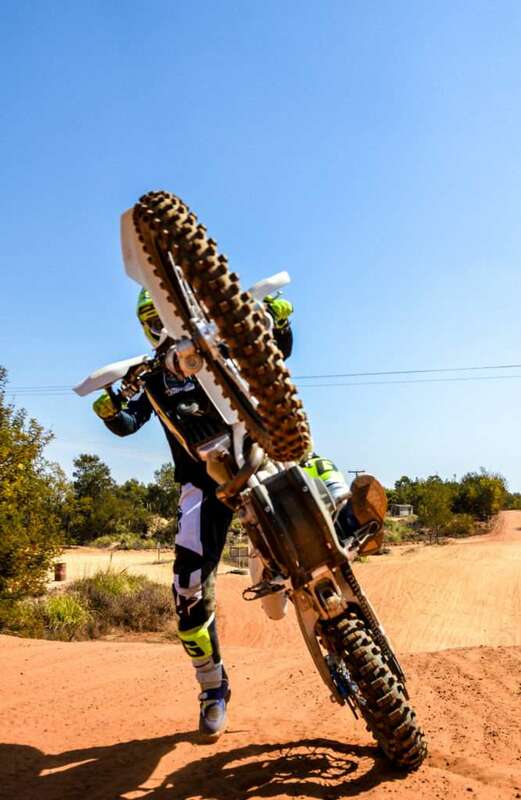 It doesn’t stop the back wheel from spinning when you are too vigorous on the throttle, like the road versions do, but measures the spin of the crankshaft against the throttle position. This means that it will only cut it if it feels the revs spike without the throttle opening more. 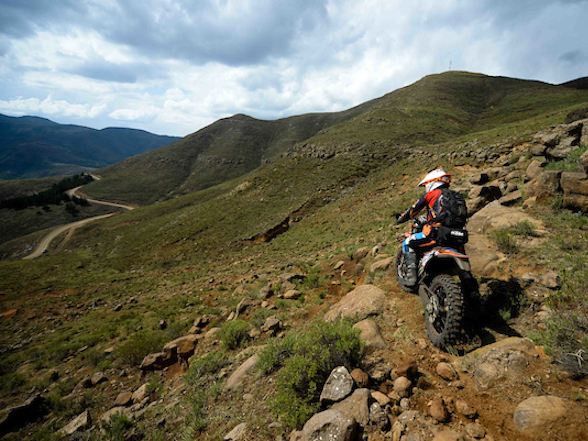 So if you are going up a steep hill at a consistent throttle and hit a slippery patch, only then will it kick in. So going around a corner and snapping open the throttle will still offer the reward and risk of the back wheel spinning up. 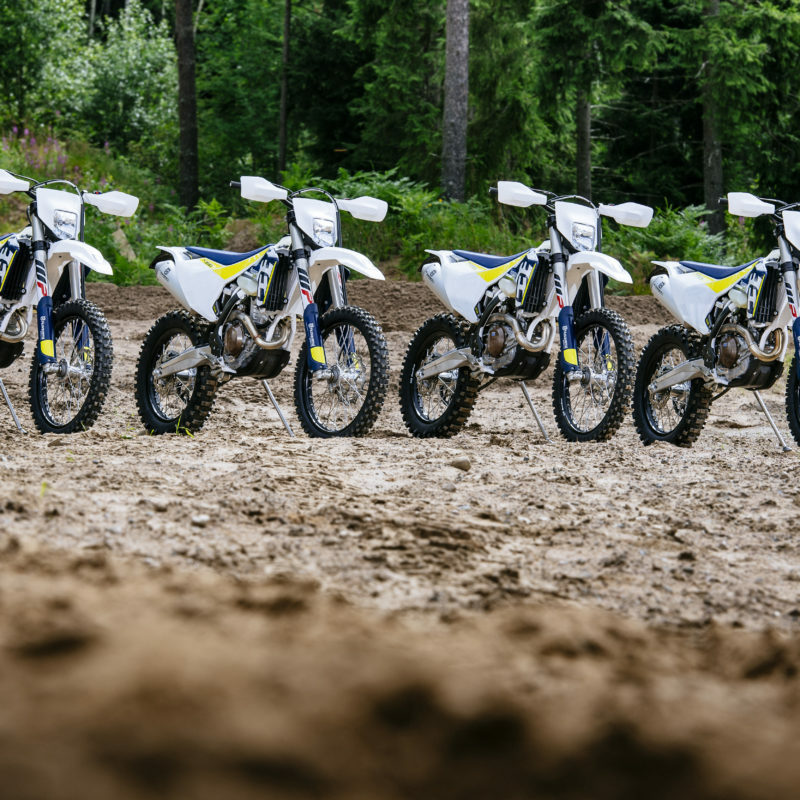 Husqvarna also hasn’t skimped on the two-strokes – they have received engine upgrades too, also receiving the mass centralisation upgrade, plus a new balance shaft resulting in an amazing 50% less vibration. Where the new models show further upgrades over the KTMs is in the addition of CNC triple clamps, a bash plate standard, DID rims and an airbox with better airflow than the orange gang. 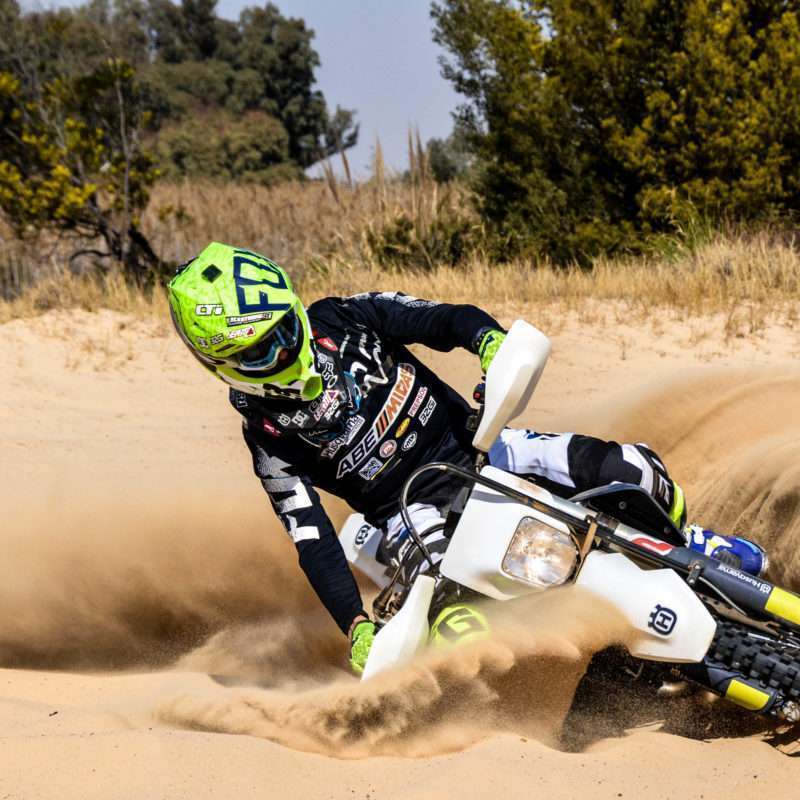 Multiple champion Richie vd Westhuizen showing off on the new Husqvarnas. But a true indication of the success of a new model is in comparison with its predecessor, and no one knows them more than the people who race them, in this case both the Husqvarna factory enduro and MX racer and multiple SA champ, Richie vd Westhuizen. 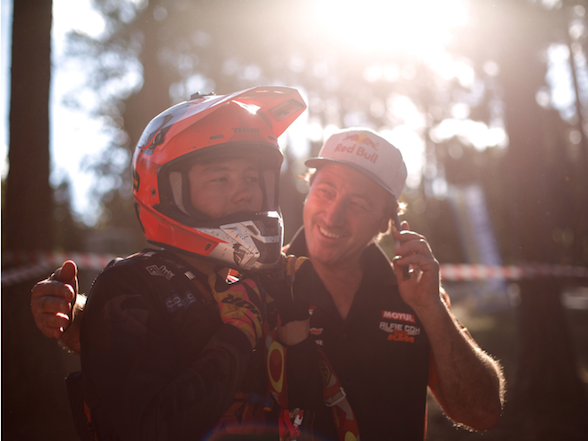 A quick chat with him at the end of the day revealed nothing but keen enthusiasm and joy. 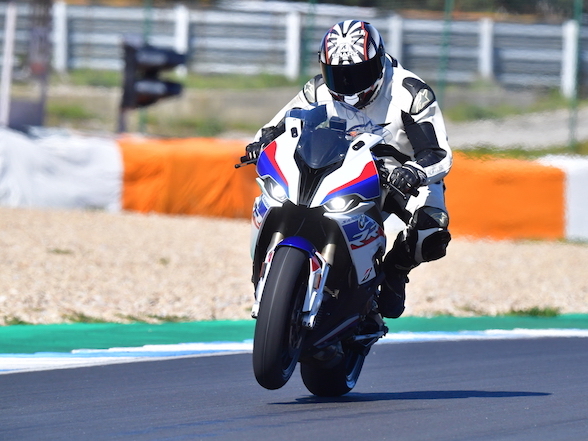 Mostly it was the chassis that impressed him, especially the new forks that were more comfortable and more responsive, as much as “ten times” more than previous models. They tipped into corners far better than the last models also, feeling much lighter and more nimble. Pressed into revealing which of the seven models he enjoyed the most, he eventually admitted to being the most impressed with the TE300, no doubt enjoying the two-stroke upgrades. The question remains as to whether customers should buy the yellow, white and blues over the oranges or Japanese alternatives. 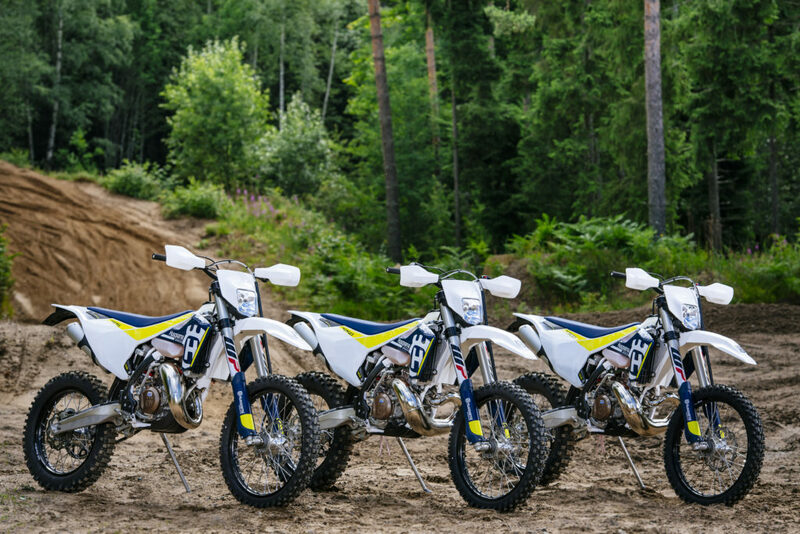 The easiest comparison is with Husqvarna’s sibling, KTM. 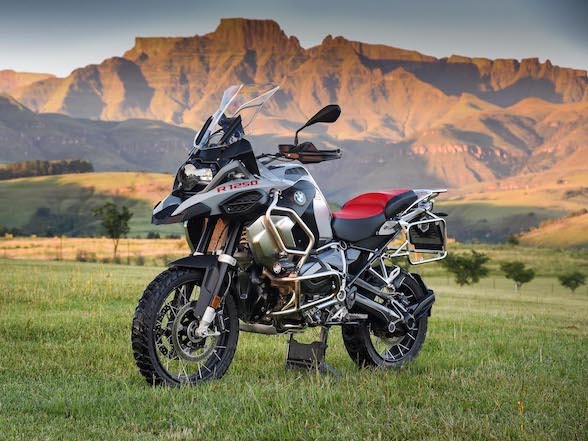 It is true that the Huskies are better equipped than the KTMs, but at the same time cost more, sometimes as much as R20,000 more, which is a good deal of money. 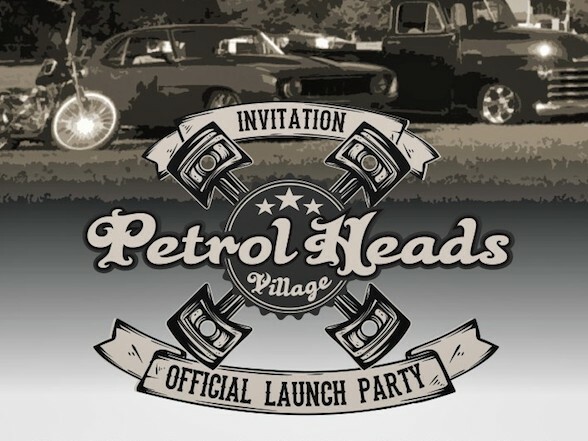 Richie vd Westhuizen showing that the motors are not short of oomph. Although, when it comes to value, the Huskies then gain some serious ground. 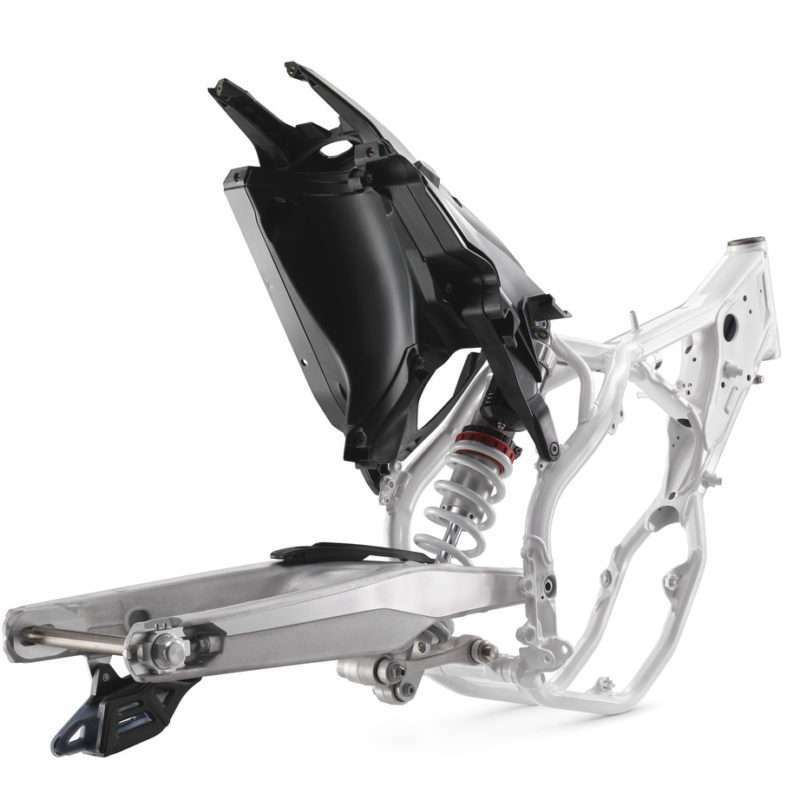 Were anyone to attempt to upgrade a KTM to the level of a Husqvarna (which is impossible because the carbon-fibre subframe is unavailable in the KTM catalogue) it would cost a good deal more. 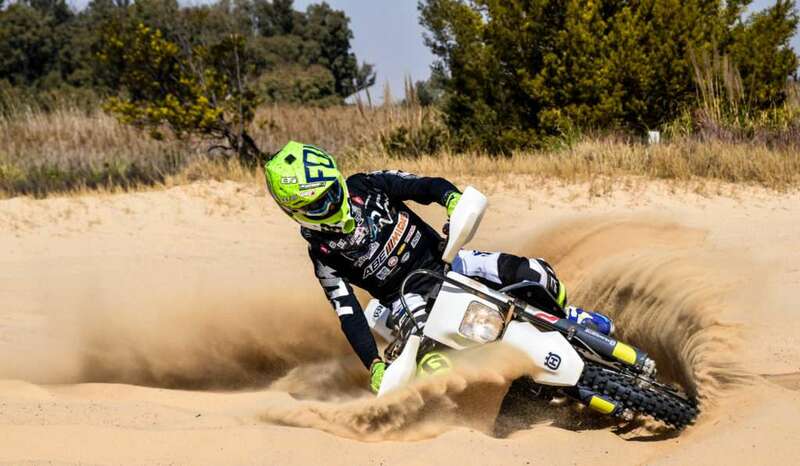 So buying a Husqvarna seems like a no brainer, but it is more complex than that. 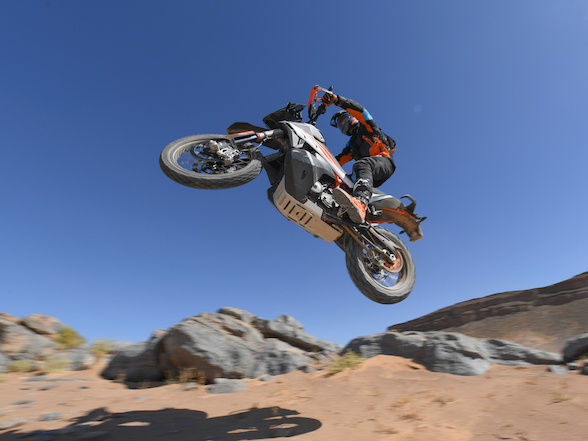 The 2017 KTMs might have a lower spec than the Huskies, but as we found last month during the KTM launch and Jozi2Kosi, they are still utterly spectacular motorcycles, feeling both light, compliant and easy to ride. The question arises, are these upgrades necessary? The answer is that it depends on who you are. 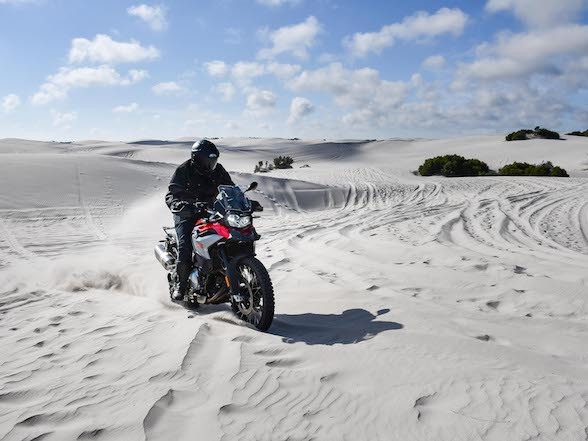 If you are a casual weekend warrior then the KTMs will serve you well, bit if you take your riding a little more seriously – a connoisseur if you like – then you will find the extra ability of the Huskies thoroughly rewarding.